This paper describes exploratory fishing trials carried out for over a year (1986-87) in the reefs of North Male Atoll in the Maldives.The aim was to assess the potential for reef fish in the Maldives and study the possibilities of developing a viable reef fish fishery. The paper provides preliminary information on various reef fish species, their abundance and rates of exploitation, and the relative efficiency of various fishing gear that can tap the reef fish resource. The trials were conducted in co-operation with the Ministry of Fisheries, Maldives, using a modified dhoti as survey vessel.Some staff were provided by the Ministry’s marine research section, while the FAO made available the services of a master fisherman and a fisheries biologist. 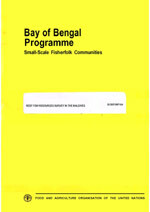 The exploratory reef fish project, and this paper which reports on it, were funded by the UNDP (the United Nations Development Programme), and carried out for the FAO by the BOBP or the Bay of Bengal Programme for Fisheries Development. The BOBP began in 1979 and covers seven countries around the Bay of Bengal — Bangladesh, India, Indonesia, Malaysia, Maldives, Sri Lanka and Thailand. Its main goals are to develop, demonstrate and promote new ideas, technologies or methodologies to improve the conditions of small-scale fisherfolk in the region. 3. Growth parameters from other parts of the world, for species occurring in the study area.